In Skid Row on the third Wednesday of each month, 6-8pm. We are always looking for more volunteer lawyers to join the clinics. It is a good opportunity to get courtroom experience and help people in need. Please complete the form below to get involved and prepare to arrive 15 minutes before the clinic begins. What are Homeless Citation Legal Clinics? 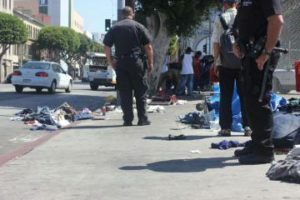 The City of Los Angeles and LAPD have systematically cited people experiencing homelessness for minor “quality of life” violations in Venice and downtown in an effort to drive them from these rapidly gentrifying neighborhoods. These are minor citations for things like sitting on the sidewalk, sleeping on the beach, smoking in public, urinating in public (bathrooms are closed at night), jaywalking, etc. In response NLG-LA along with Los Angeles Community Action Network and Venice Justice Committee have held Homeless Citation Clinics in Venice since Fall 2014, and Skid Row since Summer 2015. The clinics are staffed by community volunteers, law students and pro bono lawyers, holding regular intakes, then providing lawyers to go to court to fight the cases. Often times, the battle in court involves explaining to the judge our clients’ situations, how they became and remain homeless, and how the cost of the ticket will greatly harm them in their efforts to survive. So far our lawyers have been extremely successful in getting cases dismissed.